"Asmita's life changes when she meets Isaac, a shepherd who lives with his sheep in the Himalayan mountains." An outstanding short film produced by 10 students from Danish school The Animation Workshop (with the help of 13 more animators), The Shepherd presents two small external conflicts and a bigger one, two main characters plus an extraterrestrial creature, and a well crafted mystery staged in the Himalayan mountains. The film initially follows expectations and builds its rural world through environment, characters, iconography, aesthetics, sound and unfolding plot. Wide and very wide shots are used to describe the landscape, with an accent on portraying nature and use of sensory images (breeze, rain, thunder, etc.). After the premonitory dream of the child character, however, the film’s iconography, sound, aesthetics, staging, etc., veer towards the science fiction genre, introducing a strong element of surprise and uncertainty, and increasing the level of conflict. The action sequence of the fight between the shepherd, the child and the recently-arrived extraterrestrial is worth noting. It makes effective use of camera moves, fast-paced editing (including parallel editing), increased visual rhythm, music and heightened tension. 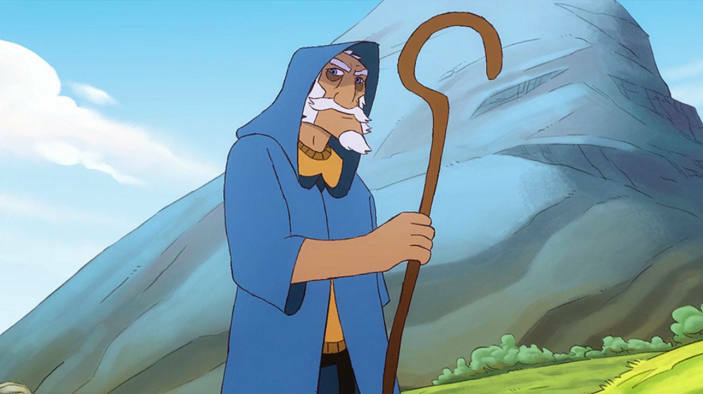 Throughout the whole film, a lot of attention has been dedicated to color, lighting, animation and aesthetics in general, including character and environment design. What makes the film work so well? If a script is meant to hook, captivate and surprise viewers, The Shepherd certainly achieves this. Up to the end, it always keeps adding layers, surprising the audience and expanding the scope of the short.